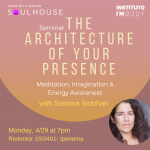 I am the founder of The Soulhouse School, which exists in in the intersection between Presence and Conscious Creativity. I work with students and clients to achieve their highest potential and most authentic expression. The Soulhouse School, offers three types of training : Presence Training, Abundance Training, Creative Process. We are a school for creatives of all ages seeking their voice, and the energy and focus to help bring it into expression. We are fully committed to the philosophy that your answers are within, that you are totally unique and have your own purpose to experience and fulfil. The Soulhouse method focuses on natural tools we all already have. Students practice inner listening, opening up all the senses and levels of awareness, and practice exercising their powerful imagination to learn, perceive, understand and create. The Soulhouse School is for all ages, we teach live, online and offer workshops anywhere on the globe.